So, the sun is out, my veggies are growing and it looks like we’re going to continue having this lovely weather for the rest of the week. And to kick off the end of the busiest period of my life, I decided to have my very first giveaway. I’ve always been a bad eater, and as a result, I don’t really take care of myself as well as I should. I mentioned this in a previous blog post, and it was my and Roz’s general health that led me to start to venture slowly into growing my own veggies at the very least. What interested me most were the statistics around digestive health. According the the Health service executive, in 2006 alone, of the five conditions using the most bed days in hospitals, 30% of people suffered from diseases that affected the digestive system. They also state that for all conditions, a change in lifestyle makes an incredible difference. So yes, with all the stress I’ve been under, I know I haven’t been looking after myself but it’s good to know I can do something about it. From Irritable Bowel Syndrome, stomach ulcers, bloating…I know at least one person that suffers, and that’s in my family alone. So anyhoo, getting back on track, when I was asked if I would like to run a giveaway on my blog, I was interested. Alflorex® is the only PrecisionBiotic™ supplement in Ireland to contain the unique and patented culture Bifidobacterium infantis 35624. It is in one-a day capsule form that should be taken as part of your daily routine, with or without food. Gluten free with only trace amounts of dairy, I have also been assured that it is compatible with breastfeeding, which of course was always going to be a deal breaker for me. I was sent on a month’s supply of the capsules because to be honest, I just wouldn’t feel right giving away something I haven’t tried myself. So I’m starting today and will write up a review when the bottle is empty in four weeks’ time. 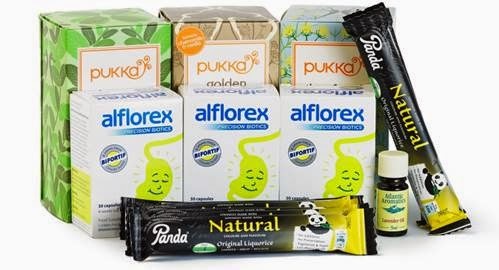 Then you’re in for a treat, because this is what it contains: three months’ supply of Alflorex Natural Food Supplement, three boxes of Organic Pukka Teas, 8 Panda Liquorice Bars and a 5ml bottle of Lavender essential oil, all of which promote good gut health. I can’t accept any entries from outside of Ireland, so it makes any Irish readers more likely to win, which I would jump at to be honest. I’ll pick a random winner on the 1st August, so best of luck to everyone!